When Jewish immigrants from Eastern Europe arrived in the United States at the turn of the last century, they sought community resources that would provide social and financial support and help them maintain their cultural and religious traditions. Most joined mutual aid societies that, among other services, provided cemetery plots and traditional religious burials for its members. However, there were many Jewish immigrants who were unable to sustain society membership or through various other circumstances found themselves without connections that would ensure a traditional Jewish burial upon death. 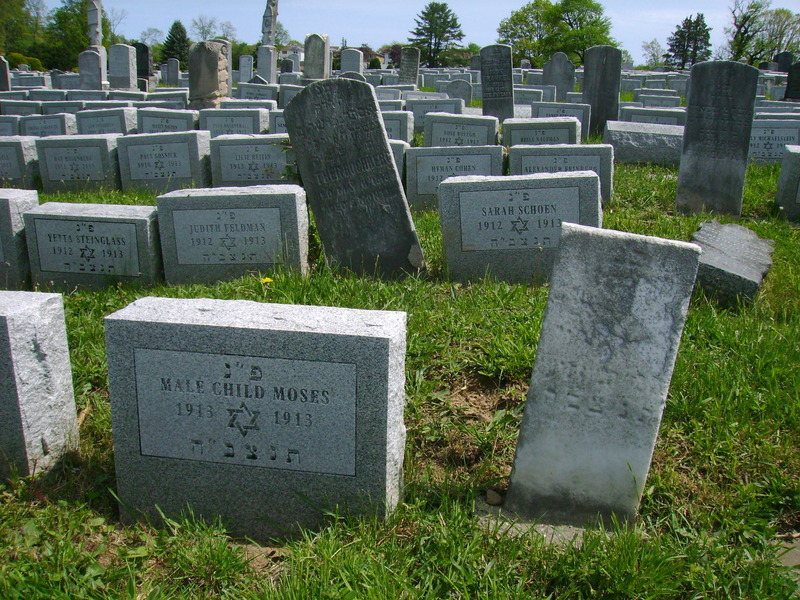 Indigent Jews in New York City who were unaffiliated with a burial society or synagogue at the time of death risked burial in a communal grave on Hart Island, the city’s public burial ground, which contravened all aspects of Jewish religious law. Burial in accordance with traditional burial practices is central to Jewish faith and the threat of mass interment in a common grave among strangers posed an existential crisis in the Lower East Side Jewish community during the late 19th and early 20th century. In response, a group of Jewish businessmen founded Chebra Agudas Achim Chesed Shel Emeth (The Society of the Brotherhood of True Charity) in 1888, specifically to bury the unaffiliated Jewish indigent of the Lower East Side with religious observance. 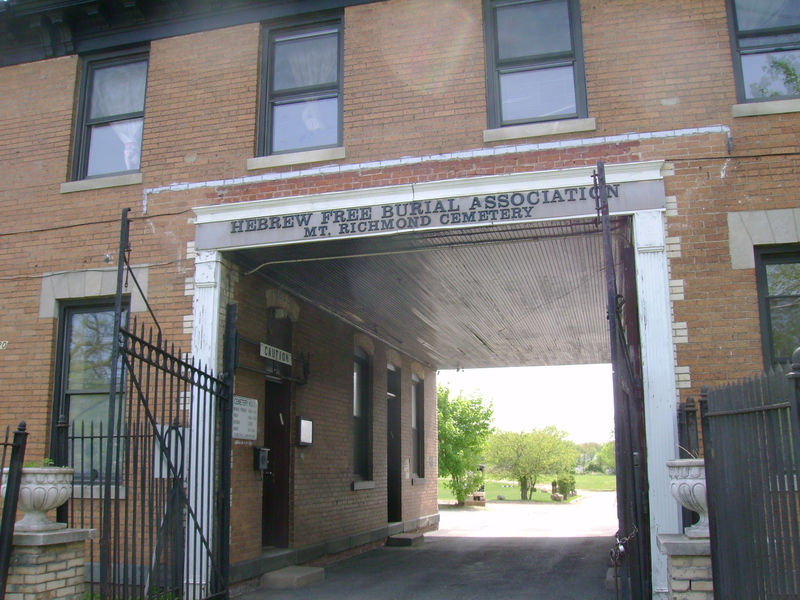 Later known as the Hebrew Free Burial Association (HFBA), this organization grew to serve the broader metropolitan area of New York City and is currently the largest free burial society outside of Israel. 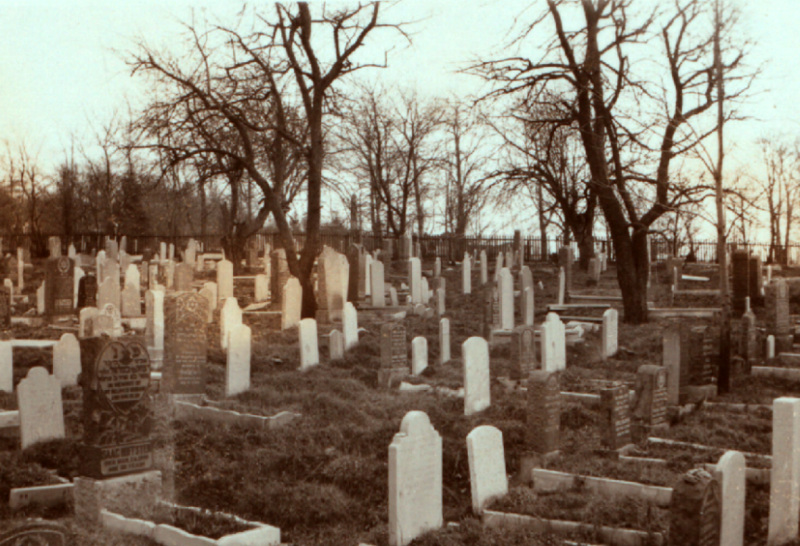 Early in its history, HFBA arranged for burials wherever plots were available, usually at Bayside Cemetery in Queens. To meet rapidly increasing need, in 1892 the society purchased its first burial ground, Silver Lake Cemetery on Staten Island. This six-acre cemetery is situated between two older cemeteries—Silver Mount Cemetery and Woodland Cemetery—on the east side of Victory Boulevard in the Grymes Hill area of Staten Island. Approximately 13,600 impoverished, marginalized men, women, children and infants were given traditional religious burial here until the cemetery’s capacity was met in 1909. Though most of the cemetery was used for burying indigent Jews, several small sections were purchased by other Jewish burial societies and synagogues for the interment of their members. Among them is Congregation B’nai Jeshurun of Staten Island, the first Jewish congregation of Staten Island. While the HFBA stopped burying individuals at Silver Lake in 1909, these other groups continued to sporadically use their portions of the cemetery until about 1950. Today Silver Lake is inactive and is available to visitors only by appointment; however, the HFBA is in the process of restoring the cemetery to open it as a historic site and in 2017 it was listed on the National Register of Historic Places. 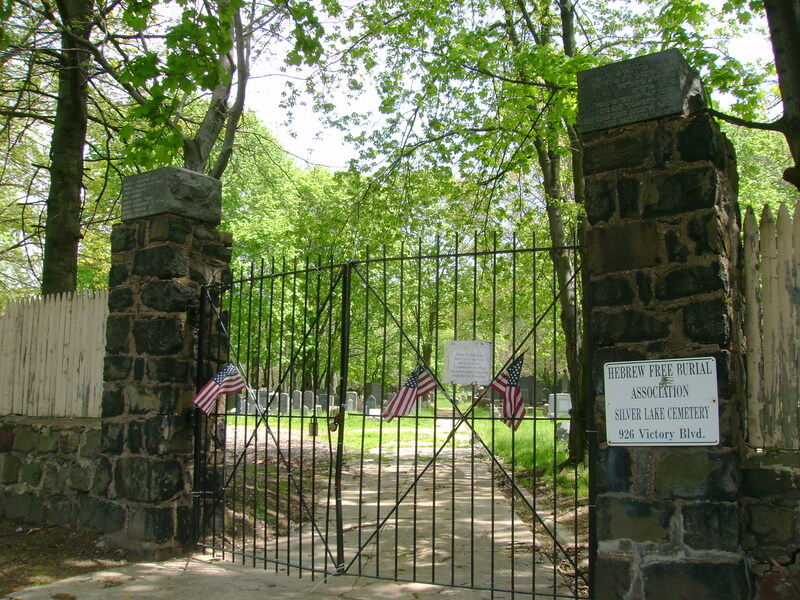 After Silver Lake Cemetery was filled in 1909, HFBA began burials in its second cemetery about five miles south of Silver Lake in the Richmond area of Staten Island. 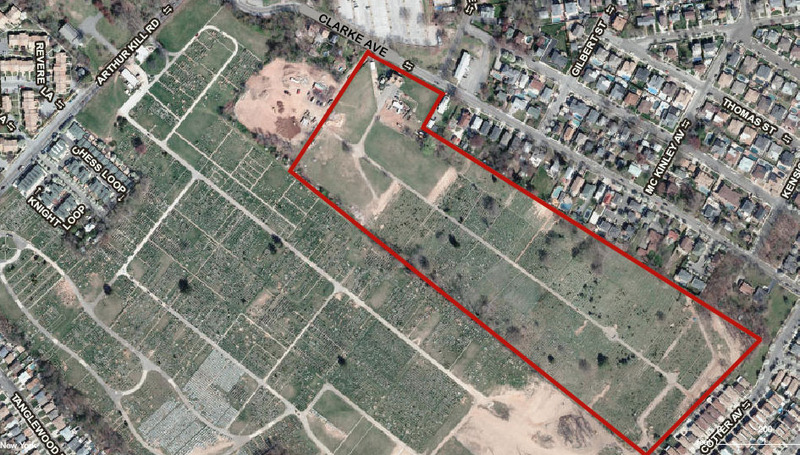 Known as Mount Richmond Cemetery, this 23-acre burial ground is situated on the south side of Clarke Avenue east of Arthur Kill Road adjacent to United Hebrew Cemetery. At Mount Richmond, the HFBA has provided dignified burials to 55,000 of the Jewish poor and continues to bury about 400 each year. The neat rows of graves tell the story of the history of Jews in this country over the last century—the earliest graves those of Lower East Side immigrants, 22 victims of the 1911 Triangle Shirtwaist Factory Fire, veterans of the wars, and, in recent years, immigrants from the former Soviet Union, many of whom were unable to observe their religion in their homeland but expressed the desire for a traditional Jewish burial. Many of those laid to rest at Mount Richmond have no headstones, but the HFBA is working to place some type of marker at each grave. Granite markers engraved with personal identification and the Hebrew abbreviation for “here lies the soul” have been placed at thousands of these unmarked graves, creating vast fields of uniform headstones throughout the cemetery. Honoring the less fortunate of the Jewish community with a proper burial and maintaining their resting places with dignity is considered an important obligation and truest act of charity because it cannot be repaid.